Infernum is the temple of the demonic creature Abigor. It appears in the Club Nintendo comic "Super Mario in Die Nacht des Grauens". Mario, Link and Kirby get there by crossing the Elm Street Tunnel. When reaching the end of the Elm Street Tunnel, Mario and his friends stumble across Chuckie and another demonic creature. When being asked why they entered the tunnel, the three of them (who, due to a spell, are wearing women's clothes) claim to be charwomen who have come to clean up Abigor's room. The monsters don't fall for this excuse, but open a door and kick the friends in. The room turns out to be Infernum. It is a cavernous room with a huge pentacle on the ground, painted in green, yellow and red. The friends meet Abigor and also many of his allies inside. 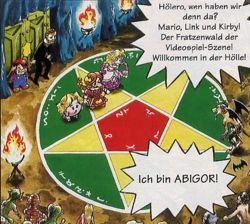 Abigor claims that their mission to rescue Toadstool (who was turned into a zombie by him) ends here, but Mario, Link and Kirby manage to defeat the monsters by using spells from a grimoire. After fighting the monsters back, Mario enters another room where Toadstool is held captive. However, it is unknown whether or not this room is part of Infernum. It is implied that Infernum is actually Hell. When Mario and his friends enter the temple, Abigor says "Welcome to hell." "Infernum" is also a Latin term referring to Hell. This page was last edited on March 25, 2018, at 16:48.